How secure is your power plant data? What do you do when a turbine PC breaks down or stops functioning properly and must be repaired or swapped out? Did you make provision for this and did you implement a backup strategy that protects you from sudden data loss and helps you to reconfigure a faulty PC or a replacement PC? We have an affordable solution that you can implement in a snap. Das n7® Backup & Recovery Kit is a fully-automated solution that forms the foundation of a much-improved resistance against downtime while simultaneously gaining OEM independence. 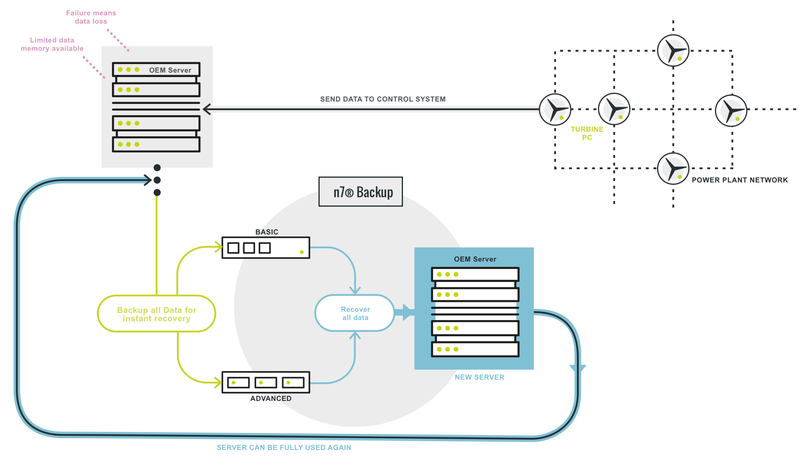 The n7® Backup & Recovery Kit creates copies of your OEM-typical databases and OEM software configuration on your turbine PCs, and continuously and incrementally updates these copies. In case of a hardware swap or repair, the replacement PC or repaired PC can be configured very quickly without disturbing the operation of the remainder of the power plant. The n7® Backup & Recovery Kit is available in two hardware options. The basic version is meant for installing in a business / office environment while the rackable server is conceptualized for an industrial environment. Both systems are configured as a NAS system and are directly connected to your power-plant network to ensure that the n7® Backup & Recovery Kit has uninterrupted and fast access to the turbine PCs. Both options are delivered with multiple hard drives configured as a RAID system to guarantee high availability. If you’re not sure whether your network can handle additional traffic without affecting system performance, we can check this inside the framework of our customized System Inspection. Turbine PCs are generally equipped with a data buffer. This buffer determines the minimum time interval between saving backups to the central data-storage server. If you opt for the n7® Backup & Recovery Kit, we clarify up-front with you the configuration of the backup routine. After we have implemented the chosen configuration, we thoroughly test the functionality of your n7® Backup & Recovery Kit. In case you choose a service plan included with the n7® SCADA Care (Level 3), we check in regular intervals the functionality and consistency of your backup routine as it was delivered and handed over to you.